The main focus for the 675LT Spider is clear: to deliver maximum performance, engagement and excitement. 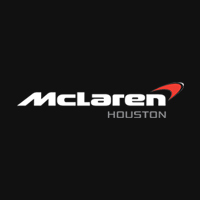 To achieve this, weight has been reduced by 100kg through the increased usage of carbon fibre – the signature material of McLaren – and by lighter components throughout, including newly developed suspension geometry derived from the McLaren P1TM, resulting in an increased track of 20mm. Under the skin sits the heavily-revised 3.8-litre twin turbo V8 powertrain from the Coupé sibling, ensuring performance figures are worthy of the LT badge. The power output and torque figures remain unchanged, with 675PS (666bhp) delivered at 7,100rpm and 700Nm (516lb ft) available between 5,000-6,500rpm. The changes to the powertrain saw more than 50 percent of the components replaced to ensure optimised levels of power, torque and drivability. These include new, more efficient turbos, detail design changes to the cylinder heads and exhaust manifolds, new camshaft and lightweight connecting rods, and a faster-flowing fuel pump and delivery system. 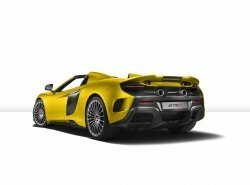 As standard, the 675LT Spider is fitted with 10-spoke Ultra-Lightweight forged alloy wheels – 19-inch at the front, 20-inch at the rear – and P ZeroTM Trofeo R tyres, developed for the 675LT models in collaboration with technical partner Pirelli. These are the lightest wheel and tyre set ever offered by McLaren. 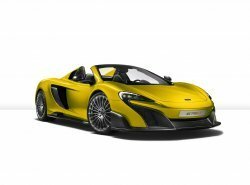 Two Super-Lightweight wheel options are optionally available; a new 20-spoke design, offered in liquid metal or diamond cut finishes, and the five-spoke Super-Lightweight design which debuted on the 675LT Coupé. 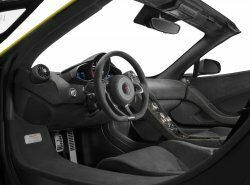 The lightweight theme continues throughout the interior with Alcantara® and bare carbon fibre used extensively. 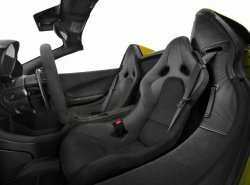 A pair of lightweight carbon fibre-shelled racing seats, modelled on those fitted to the McLaren P1TM, save a combined 15kg, and feature ‘675LT’ embossed leather to provide enhanced levels of support and grip. 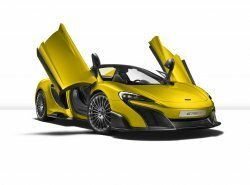 As seen in the McLaren P1TM and 675LT, heating and ventilation controls are located within the portrait-orientated, centrally-mounted touchscreen, which also operates the four- speaker Meridian audio system, while air conditioning has been removed. The 16kg system can be specified as a no-cost-option. 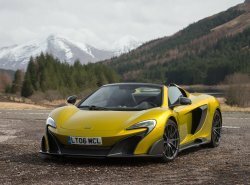 0 comments so far on THE McLAREN 675LT SPIDER. POWER. A BEAUTIFUL THING.